Vibrant spirit and stunningly located in a natural setting amidst the Aravalli range of hills, The Jaibagh Palace, Kukas, Jaipur is a wonderful palace for hosting weddings and other special occasions. Creating an enticing fusion of modern culture and heritage beauty, it has a luxurious interior with very comfortable and cosy rooms and suits with beautiful ambience. Jai Bagh Palace also has an amazing restaurant which will provide tastefully accessorized multi cuisine mouth-watering dishes for your occasions. Noor Mahal, Karnal, Delhi is inspired by India’s rich heritage and captures the royalty created by Indian maharajas over the centuries. The hotel has been designed with intricate details to capture the authentic essence of traditional Mughal and Rajputana styles of architecture. 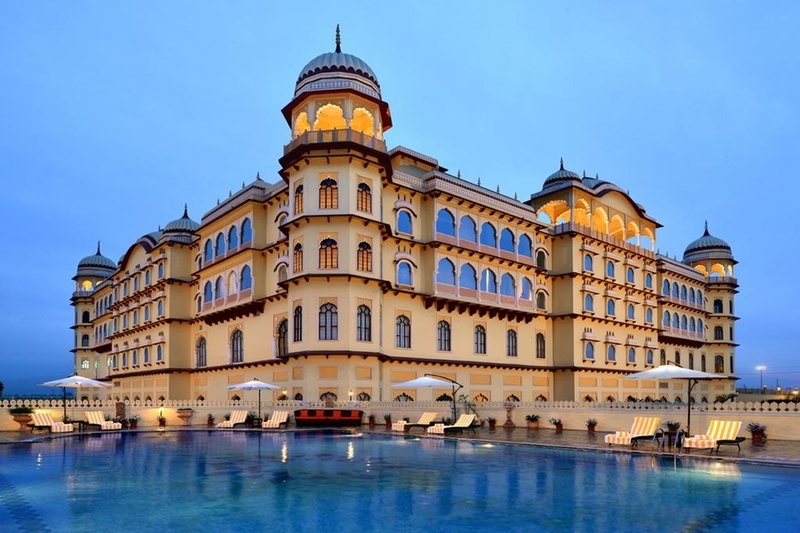 With this unique combination of traditional royal essence and modern amenities, the Noor Mahal hotel exudes warmth and comfort for all its guests. The multiple banquet halls and sprawling lawns at the hotel are perfect for your wedding, if you have always wanted a royal touch for the special day. Namah, surrounded by natural beauty and lush greenery, is located on the bank of the River Kosi at Corbett National Park, close to the wild life sanctuary. It ensures your guests enjoy the tranquility and serenity enveloping all of Jim Corbett. With more than 3116 sq. ft of flexible space, they are capable of accommodating large number of guests. The aesthetically decorated and sophisticated banquet halls and ballroom can be customized as per your special requirements. You can even indulge in exploring the verdant forest, bird watching and just enjoying the lush landscape of the Jim Corbett National Park. Hotel Clarks Shiraz, Agra is perfect for Delhi couples wanting a destination wedding. The stunning property has multiple banquet halls, weddings lawns and terrace party areas to accommodate any kind of function or party. At Hotel Clarks Shiraz, you can get your own decorator and caterer to customize the menu and decor as per your requirement and theme. The management at the venue is very hospitable and is sure to take good care of you and your guests. 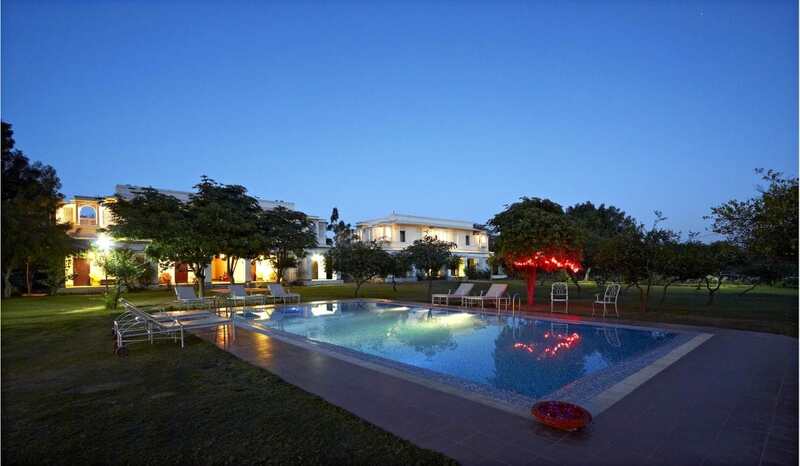 The Alwar Bagh is built in a heritage style amidst the lush green and pollution free atmosphere. Surrounded by the picturesque Aravalli Mountains, The Alwar Bagh is well equipped with all modern amenities and comforts for the guests. It is conveniently located near Alwar and Sariska and provides numerous activities- from visiting historical monuments to the exploration of wildlife and nature trails. They have 31 rooms available in the property. A destination wedding in the beautiful weather of Mussoorie? Hell, yes! Nestled amidst lush greenery, the resort offers breath-taking views of the Mussoorie town and the Doon Valley. This is one of the best places to host a wedding because in addition to the more-than-pleasant atmosphere and budget-friendly deals, they take great pride in providing exceptional food and drink, service and ambience for your wedding reception such as great wine selections, distinctive menus, beautiful floral displays, dramatic lighting and exotic wedding reception ideas. They have 2 banquet halls, a courtyard, a sundeck and a terrace – a variety of options for you to pick from. Orchha Palace and Convention Hotel, Jhansi offers lavish banquet halls and sprawling lawns for pre-wedding ceremonies, weddings and receptions. The gorgeous property can help you pull off a royal wedding in style with its awe-inspiring architecture and detailing. The staff at Orchha Palace and Convention Hotel are hospitable and warm and ensure that you and your guests have a memorable time.